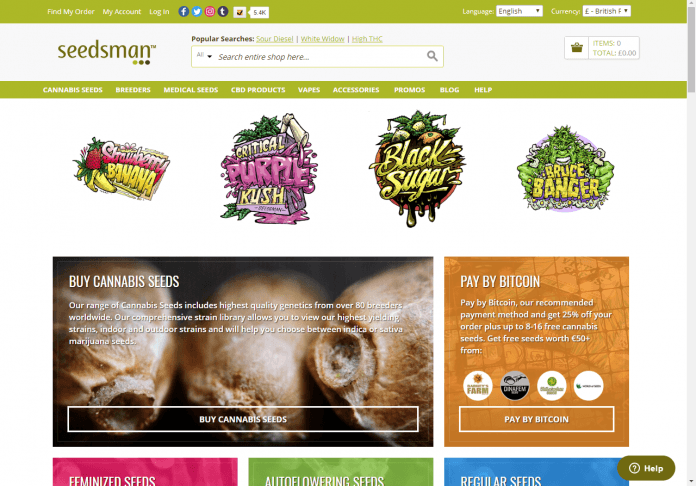 Seedsman is our choice for the best online marijuana seed bank. In our experience, they outclass the rest of the weed seed banks. Quality: Their marijuana seeds are great quality. They carry their own marijuana strains as well as those bred by reputable seed banks and breeders. 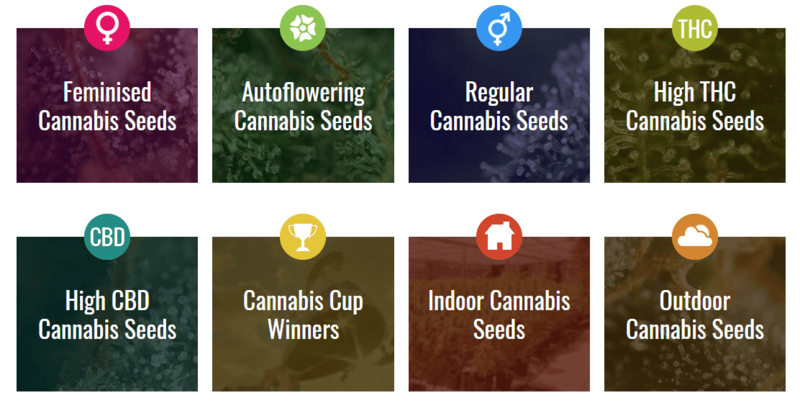 Selection: seedsman.com offers a vast selection of marijuana seeds. They represent an array of seed banks and marijuana seed breeders. There is no shortage of choice. Promotions: There are ongoing promotions that provide value for money: free marijuana seeds, free shipping, or promotional discounts to name only a few. Guaranteed delivery: Their guaranteed delivery option ensures re-delivery of your marijuana seeds if they go astray or are seized. Discretion: Many shipping precautions ensure discretion. They use plain packaging, and omit the company name and any reference to marijuana seeds. Reputation: The company has been in business since 2003 and has maintained a great reputation and trust score. Customer service: There are thousands of satisfied customers from around the world who attest to their exceptional customer service. Payment options: They offer many payment options, including bank transfer, cash, credit and cards, checks, postal orders, money orders and cryptocurrencies. Loyalty program: seedsman.com is one of the few online seed banks that offers a loyalty program. You can accumulate points to spend on later purchases. What makes seedsman.com somewhat unique is the fact that they stock marijuana strains from over 80 breeders and 100 independent marijuana seed banks. This is in addition to their own strains. With more than 3000 marijuana seeds in stock, there is a myriad of choice available. Growers should have no issue finding their favorite marijuana strains, even when they are nowhere else to be found. They probably has the most extensive marijuana seed library on the planet. You will certainly never be without choice or diversity. Seedsman is based in the United Kingdom ships marijuana seeds worldwide. They have three shipping options: International Tracked & Signed, International Signed and International Standard. Obviously seedsman.com cannot take responsibility for what happens in your country during the delivery process, but they certainly do everything possible to assist and ensure your marijuana seeds reach you. Guaranteed delivery: seedsman.com offers a unique guarantee, if you purchase a “discreet delivery product”. If you order fails to reach you or “goes missing” on your side, they will re-send your seeds free of charge. The company chooses the discreet product to blend with your order. Breeders packaging: As an added precaution, you can elect to remove the breeder’s packaging during the checkout process. This makes the marijuana seeds less identifiable. Plain packaging: Parcels are shipping in plain paper envelopes and packaging. Only what is absolutely necessary is included – address, tracking label, stamp, and a declaration for orders outside the UK and EU. The name of the company and the contents of the package are omitted. Seed packaging: Each seed is individually packed with only the marijuana strains initials as identification. This allows you to distinguish your seeds from each other, but does not advertise that they are in fact marijuana seeds. Seedman offers a loyalty program. You can earn points on your marijuana seed orders and and redeem your points as a discount on later purchases. You can also earn points by referring customers. They offer a number of incentives to help you accumulate points. seedsman.com delivers, but when things go wrong they have your back. You can expect excellent support. They undertake to reply to all written queries within 24 hours. They also telephone support. Customers on TrustPilot give seedsman.com a trust score of 8.8 out of 10. This is based on nearly 5 500 reviews. 80% of reviewers describe the seedsman.com’s customer service as excellent. There are always great promotions at seedsman.com Some are ongoing, while others are temporarily. Typical promotions include discounts when spending a specified amount, discounts on certain payment types, free shipping offers, and regular discounts on different marijuana strains and breeder discount promotions. The company accepts a wide variety of payment options, including bank transfer, cash (in EUR, GBP and USD), credit and cards, checks, postal orders, money orders and cryptocurrencies. We recommend their Bitcoin option that ensures anonymity and includes additional discounts. Although their prices are not the cheapest on the net, they sure make up for it in discounts, promotions, not to mention exceptional quality marijuana seeds. Overall, Seedman stands out as an exceptional marijuana seed bank. Give them a try and they are sure to become your weed seed bank of choice. Next articleBest online marijuana seed bank! Where to buy marijuana seeds online!